I feel very fortunate to have British designer Jean Moss visit my blog. I've been a fan for years, knitting one of her early designs, Sculptured Fairsle, in the early 1990s. Hi Jean. Welcome to my blog. It’s a thrill for me to have you visit me as I’ve been a fan for many years. Congratulations on the publication of your newest book, “Sweet Shawlettes”. I’m curious about your creative thinking. What generally comes first? An idea, the yarn, a request from a yarn company, something else? My career has always been fashion-led, so each season I look at the trends. I also love street fashion and like nothing better than to sit in the sun with a cup of coffee and observe what people are wearing - especially in the big cities. I’m also fascinated by old fashion illustrations, the designs of David Downton, Rene Gruau and Erte are mega-inspiring. My camera is always to hand and I take many pictures of interesting objects, people and places - looking back over them often sows the seeds of new designs. I think that you’re very lucky to work so much with Rowan yarns, my favorite company. How did you become involved with Rowan initially? I became involved with Rowan way back – magazine #4 if my memory serves me well, when Stephen Sheard, founder and co-owner, came to see me in our workshop in York. At this time the business had already taken off and it was a hive of activity. We employed quite a few people, who were involved in making up and sending out kits to knitters all over the country, finishing off the completed sweaters, quality control, labeling, packing and shipping. I was doing a lot of design and production for Polo Ralph Lauren and Laura Ashley, as well as selling my own line of handknits to many top-end US stores. Stephen had seen the fairisles I’d done for Ralph Lauren, which all used Jamieson & Smith Shetland yarn. He reckoned my perception of colour would translate well into his 4-ply botany yarn (still one of my alltime favourites) and asked me to do an exclusive version of a dolman-sleeved crew neck sweater. This became the Bellmanear, named after our beloved old farmhouse in the Yorkshire Wolds where we were living at the time - the first of many subsequent designs for Rowan. How long did it take from the beginning until the book was ready to go to the publisher? This may come as a surprise, but the timeframe for the book was alarmingly short. I was asked to write the book in November 2010 and I had to deliver the completed manuscript by the end of March 2011. It did seem like a huge ask from scratch, but I’ve always found it hard to turn down interesting new projects, so it didn’t take me long before I jumped in and agreed. The schedule seemed to dovetail with other things I was committed to at the time - Knit Morocco, one of our knitters’ tours was due to start in the last week of March. I reasoned that if I could eliminate all other projects for the next four months, it was doable. However, I certainly couldn’t have done it without my band of trusty knitters who tested every stitch, but it did require an unswerving daily commitment. Do you have plans for another book in the future? If so, can you give us a hint about it? It was a treat to have Jean visit on her blog book tour. I have plans to make more of her sweaters in the future as well as another project or two from Sweet Shawlettes. You can see all the designs in the gallery, here. I've almost finished the Penumbra Cowl and I'm seriously drawn to the Ceilidh Shawlette. I’d also like to take one of her tours. Last year she took a group to Morocco (I’m so envious) and this year the trip is to Ireland. To learn more about Jean Moss’ designs and tours check out her website: http://www.jeanmoss.com/ and the Ravelry group, found here. You can purchase Sweet Shawlettes at a yarn shop or bookstore near you, or online at one of these sellers: Amazon, Chapters/Indigo, Threads Magazine, or Taunton Store and I'm sure that there are more. GIVEAWAY: I have three copies of this beautiful book to giveaway. Leave a comment and you're entered to win. Winners will be chosen randomly. Perhaps you'd like to tell us the name of your favorite design? Winners will be announced next Friday, January 13th. Good luck. Here's is the full blog tour. Why not follow Jean on her travels around the blogosphere? Looks like a nice book! Jean Moss is one of my favourites too. So many cute designs. I can't wait to see the rest of the book. Thanks for the giveaway. Great Interview and how exciting that you have THREE copies. I hope that one of them finds it's way here! I would definitely knit Miss Garricks and I do like the plaid too. My favourite Jean Moss knit was Eriskay Cardigan. Just loved knitting it and the finished sweater. The designs are so beautiful. It's not a matter of which is a favorite so much as which one to do first! She is so lucky to be a guest on you blog! Looking forward to seeing the completed Penubra shawl, it really looks interesting. My favorite is Miss Garrick's - thanks for hosting this and doing the giveaway. 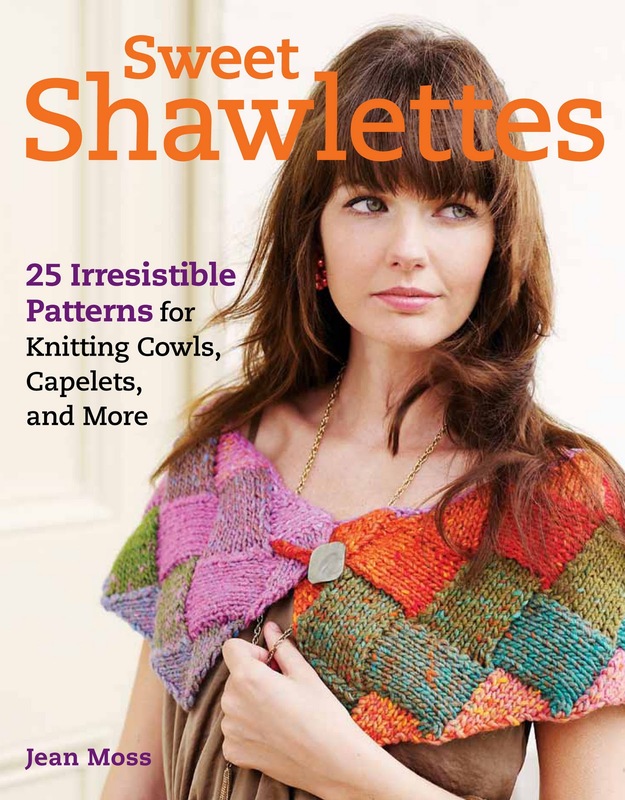 The entralac shawlette on the front cover is my favorite so far! The designs in this book are lovely, I feel next year's Christmas knitting plans forming! I wish I could go on the tour to Ireland...but I'd love to settle for a book! I have done many of Jean Moss's patterns and like them all but one favorite. Would love to be able to get a copy of her book now that finances are really stretched and most books are out of reach. I really enjoyed the interview and being new to knitting I'd love to win a copy of "Sweet Shawlettes" to try some of Jean's designs. Jean Moss always provides classiness and innovation, along with great style and texture. Thanks for sharing information about her new book! All lovely but would love to knit the Eriskay Cardigan. And I love to knit - and wear - shawlettes! Out of this book I would be most likely to knit Vamp, Mantilla or Grace - but now I want to see all of her other designs too. Jean's work is wonderful and I love the idea of a blog tour. My all-time favorite design is her Eriskay Cardigan. Congrats Jean on your new books - it's about time! I love anything by Rowan although lately some of their designs have become very fashion week and artistic. Absolutely love the cover picture in the new book! Looking forward to some fun knitting. Thanks for the wonderful interview! I like several of the designs, but I think I like Green at Heart best! Beautiful book. I'll probably make one of the lace shawls, but I love the entrelac on the cover! Thanks, Joanne! Wow, those are such beautiful designs! I would have to say my favourite is ceilidh. Just amazing! Great looking book. Would love to win so I can knit Frost first. I really like the Polerro Cape. I feel like I would start with the purple patch first though. The book has many pretty designs though. Very intriguing. This is my first visit to a blog tour so the book will be especially memorable. I'll put it on my wish list but of course I hope to win one! A blog tour- fun! I love the shawlette done in entralac on cover of book. Would love to win. It looks like a great book! I could use some great shawl patterns! Oh how fun...I would love her new book as I have long admired Jean's style! Favorite pattern is Wicked...simple yet so stylish! This book looks awesome! I'd love to make Green at Heart, and the shawlette on the cover! I LOVE the design that is pictured on the front cover of the book! THis looks like a great book. Thank you for the giveaways! Thanks; my fingers are crossed and my needles are too! It's great to see a new book from Jean. I wantto make Bess.